Click Here to download Rights Under Title VI. The O’Fallon Rotary Club owns the Rotary Van which operates Monday through Friday from 8:00 am to 3:30 pm out of the O’Fallon Township Office. The purpose of the program is to provide free or low-cost rides to O’Fallon residents throughout O’Fallon Township and O’Fallon city limits. Every Wednesday, the van transports riders to St Clair Square in Fairview Heights. This trip is regularly scheduled from 9:00 AM to 1:00 PM and costs all riders $1.00 each way. Fare: Age 62 and older, as well as handicapped persons, ride the van for free. Individuals 55-61 pay fifty cents while all others pay $1.00. The service is curbside only. The driver is only allowed to help passengers on and off the wheelchair lift. Please be ready at least 15 minutes before your scheduled pickup time. However, due to traffic & construction, please be patient. Rides must be scheduled a minimium of 24 hours in advance. When shopping please limit your purchases to four manageable bags. Will calls will be picked up as the driver’s schedule allows. There is no eating, drinking, smoking or profanity allowed on the van. Riders must wear their seatbelts at all times. The wheelchair lift is limited to 600 lbs (including the weight of the wheelchair and the rider). Only service animals are allowed on the van. The van does not transport children from home to school or from school to home. Due to the unpredictable schedule of physicians, we will not schedule any rides for appointments after 1:00 P.M. We do not want to leave anyone stranded. The last ride is at 3:30 P.M. every day. Special requests will be handled individually. 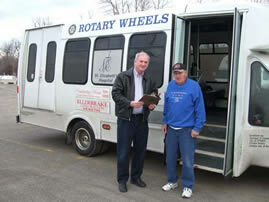 The O’Fallon Township Rotary Van may not operate when roads are icy and unsafe or during inclement weather. For more information on the Rotary Van call the Township office at 632-3517.